The development of self-propelled micro- and nanomachines able to emulate the intricate inner workings of the human body and/or the natural environment has captured the imagination of an ever expanding research community since the turn of the millennium. It is envisioned that these devices will play an important role in nanomedicine and environmental remediation. One of the main challenges faced by scientists lies in the quest for efficient ways to power these machines without drawing on external sources. Studies over the last decade or so have produced sample batches of motors able to capture, transport and deliver loads, or sense and neutralise chemical or biochemical pollutants, among many other tasks. However, the understanding of the precise mechanisms causing these actions is limited. The issue is how to study the physiochemical reactions and other phenomena that occur in an object that is zigzagging everywhere through an aquatic medium. The first micromotor engineered back in 2004 was dubbed a "swimmer." But if you hold a swimmer in place, the same characteristics that would otherwise cause it to move through the fluid will cause the fluid to move through it, turning it into a pump. The observations of such "micropumps" can then be extrapolated to gain a better understanding of micromotors. From this starting point, researchers of the ICN2 Force Probe Microscopy and Surface Nanoengineering Group led by Dr. Jordi Fraxedas have developed a set of techniques that provide deeper analysis of the key parameters influencing this behaviour. With the additional support of Prof. Dr. David Reguera of the University of Barcelona and Dr. Borja Sepúlveda Martínez of the ICN2 Magnetic Nanostructures Group, they look at how the complex interplay of surface chemistry, chemical gradients, and electric and fluid fields is translated into motion, and how the knowledge gleaned can be used to tune the behaviour of future micromotors. Described in their paper "Unravelling the Operational Mechanisms of Chemically Propelled Motors with Micropumps," published this September in Accounts of Chemical Research, they report surface chemistry, zeta potential and surface roughness to be important factors in controlling the direction and strength of motion of different types of micromotors. Lead author Dr. María José Esplandiu explains how these findings are important not only to harnessing the full potential of micro- and nanomotor technologies, but also to understanding nature: "Like many living organisms, micromotors are known to exhibit collective behaviour, meaning they work together in coordination, saving energy and performing tasks more efficiently." Geese flying in a V formation, swarm intelligence in ants and bees, and cell responses to infection or injury all respond to this principle, operating in what are known as active matter systems. As yet, these systems are poorly understood from a scientific perspective. Artificial micromachines can potentially shed some light: "By characterising and isolating what parameters translate into what mechanical effect at the level of the individual micromotor, we can predict and control the behaviour of a batch of micromotors and set them on the path of a particular collective behaviour. This may offer insights into these processes in living organisms." 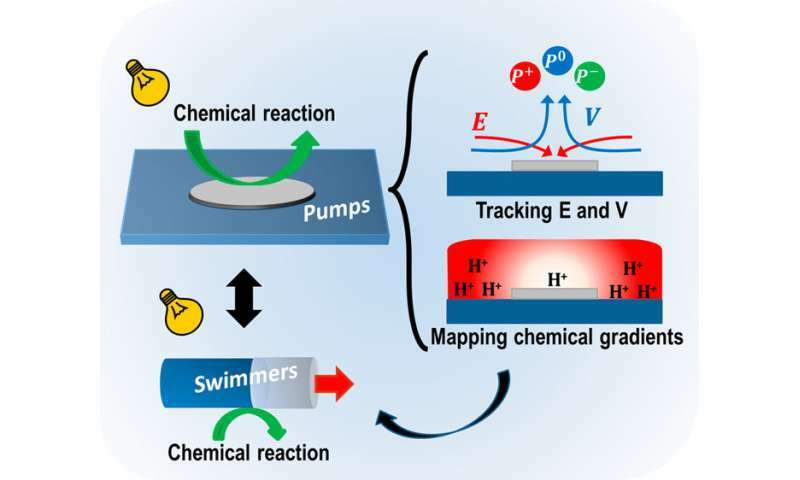 In their paper, the team takes a combined experimental and theoretical approach to the analysis of two types of pumps–bimetallic, and metal and semiconducting–presenting unambiguous data on the operational mechanisms of these chemically propelled motors.